Confidence soared that all 12 boys and their soccer coach will be successfully rescued from a flooded jungle cave in Thailand by the end of Monday after divers safely emerged from the cavern with four of the boys on Sunday. 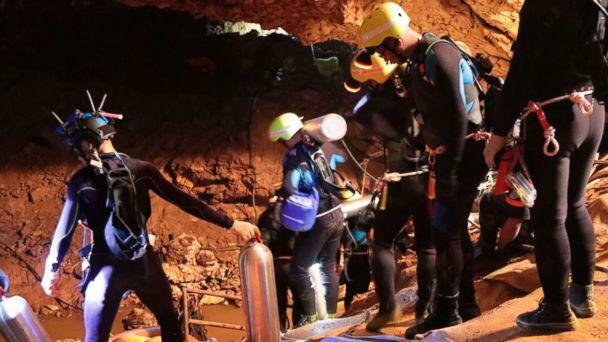 The ordeal of the soccer team has gripped the attention of the world as divers and emergency personnel from around the world have converged on the Chiang Rai province of northern Thailand with the single goal of safely extracting all of them from the bowels of the Tham Luang Nang Non cave, where they have been trapped for 16 days. An hours-long subterranean rescue mission was launched Sunday morning in Thailand, buoyed by the prays and support of the international community. By nightfall, elite dive teams trudged out of the muddy mouth of the cave with four of the teenage boys. The international effort to save the group has paired divers in "buddy teams" with the remaining eight boys and their coach. Officials hope by the end of Monday local time, all of them will be saved. Chiang Rai provincial Gov. Narongsak Osatanakorn said late Sunday night in Thailand that the second part of the mission to rescue the others would begin in about 10 to 20 hours after authorities reconvene to assess conditions in the cave and get a briefing on how the initial rescue went. "Today was very successful, more than expected," Osatanakorn said. The first boy emerged from the cave at 5:40 p.m. local time, followed 10 to 20 minutes later the second boy, Osatanakorn said. About two hours later, the third and fourth boys were pulled from the cave 10 minutes apart, he said. The names of the rescued soccer players, members of the Wild Boar youth football team, were not released. Osatanakorn did not comment on their conditions, only saying that they were all safe. 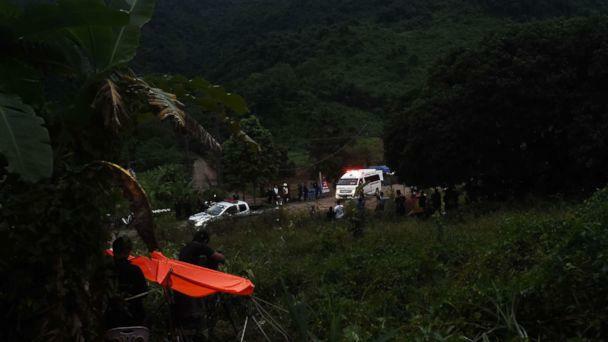 The boys were immediately placed into ambulances and rushed to a hospital in Chiang Rai, Osatanakorn said. Doctors and nurses ready with IVs waited in the emergency bay of the hospital and as the boys arrived in separate ambulances, the medical teams sprang into action, transferring the patients onto gurneys and wheeling them into the ER to be thoroughly examined and treated. While news of the miraculous rescue spread through the region, excitement and relief was tapered by the drama still unfolding in the depths of the cave, where the remaining eight boys and their coach were still holed up in a dry chamber more than two miles from the entrance. The task of extracting the remaining members of the group was fraught with dangers heightened by the death on Friday of a volunteer diver who succumbed to fatal oxygen deprivation.